My talk at the recent INFORUM 2012 conference held in Prague was about the issue of personalisation and the impact of our social network activities on search results. I believe that personalisation, and in particular contributions from our social and professional networks and even Google+, can present us with an alternative view of a topic or person that can be an important part of our analysis of a situation. I always have two different browsers open. One is not logged in to any account of any sort, has all cookies cleared at the end of each research session, and has search history disabled. The other is permanently logged in to a Google+ enabled account, social and professional accounts, and has web history enabled. This enables me to quickly switch between two very different environments to give me very different results when I am conducting research on Google or even Bing. Demonstrating this at a workshop or conference can be difficult, though, because postings and comments from the social elements of the search results may have been restricted to friends or limited circles. For the INFORUM 2012 conference I decided to generate word clouds for personalised and non-personalised results for a Google.co.uk search on the single word Prague. The titles and up to the first 250 words of the top 20 results for the searches were scraped into a document from which the clouds were generated. In the graphic below, which has been taken from my presentation, the first word cloud represents a search that is as non-personalised as I could make it and the second has been personalised by several weeks of research on what to do and see in Prague. There are no prizes for guessing what we were interested in visiting! A paper is also available on the INFORUM web site at http://www.inforum.cz/en/proceedings. It covers much of what I said but bear in mind it was written a few weeks beforehand and the presentation was updated with new developments the night before I gave the talk. This is the presentation that formed the basis of the business information workshop that I facilitated on 17th May 2012. The TFPL business information workshop held on May 17th in London turned out to be quite an intense day with plenty of questions and much discussion between the participants regarding the services and resources they use. When it came to the participants nominating their Top Tips at the end of the day there was a bit of umming and ahhing initially but they soon picked up speed and we ended up with eleven. Here they are. 1. BL BIPC industry Guides The British Library Business Information and IP Centre’s industry guides were very popular. You probably already know about the BL Business Essentials wiki Industries pages (http://bl-business-essentials.wikispaces.com/Industries) but these have now been expanded into a series of 30 PDF guides at http://www.bl.uk/bipc/dbandpubs/Industry%20guides/industry.html highlighting relevant industry directories, databases, publications and websites. One of the participants who had been using the guides since they were launched said that they are regularly updated and everyone was impressed that a named person responsible for the guide is clearly shown on each one. 2. Zanran http://zanran.com/ A search tool for identifying charts, graphs and tables of data in PDFs and Excel spreadsheets. Run your search and Zanran comes up with PDF and spreadsheet files that match your criteria. Very useful if you are looking for industry statistics. 3. Slideshare http://www.slideshare.net/ Looking for a conference presentation, an expert on a particular subject, overview or background on an industry then look in Slideshare. One workshop participant commented that they wished they had known about this a couple of weeks ago. 4. SCOTBIS http://scotbis.nls.uk/ A national information service aimed at Scottish businesses and based on the business resources at the National Library of Scotland but, nevertheless, useful information for those of us not based in Scotland. SCOTBIS provides its users with a free enquiry service and also offers fee-based research and other charged services. 6. Advanced search commands. Familiarise yourself with the advanced search commands, in particular ‘site:’ for searching within a single site and ‘filetype:’. Look for PowerPoints for presentations, spreadsheets for data and statistics, or PDF for research papers and industry/government reports. Note that filetype:ppt will not pick up the newer .pptx so you will need to include both in your search, for example. You will also need to include .xlsx if you are searching for Excel spreadsheets and .docx for Word documents. 7. BUSLIB-L – an email based discussion list that addresses all issues relating to the collection, storage, and dissemination of business information regardless of format. To join the list, go to http://list1.ucc.nau.edu/archives/buslib-l.html where there are also searchable archives. 8. Bureau van Dijk’s M&A Portal http://www.mandaportal.com/ A gateway to news, events, research and analysis on mergers and acquisitions worldwide. Some of the information on the portal home page is free of charge and there is a free search option for tracking down deals and rumours contained in BvD’s Zephyr database. The deals can be sorted by value, date or status. Basic information is free but you can purchase the full details from the Zephyr database using a credit card. The cost of the reports varies depending on the amount and type of information available. 11. ISI Emerging Markets http://www.securities.com/ Provides news, company information, industry reports and M&A from over 100 emerging markets. Much of the content is unique to ISI Emerging Markets. This was another service that was highly recommended by one of the workshop participants. Evaluated listings and subject guides from people who know the sectors are the quickest way to home in on good quality sources of information. The British Library Business and IP Centre (BIPC) has, for a long time, had a wiki at http://bl-business-essentials.wikispaces.com/Industries listing web-based resources on a number of industries. 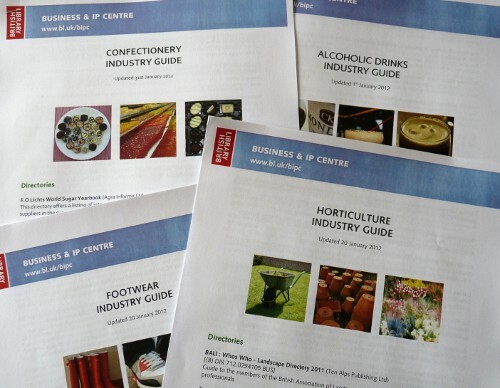 These have been expanded into a very useful series of 30 PDF guides at http://www.bl.uk/bipc/dbandpubs/Industry%20guides/industry.html highlighting relevant industry directories, databases, publications and websites. All of the guides show when they were last updated and the name of the person who has edited the guide. Not all of the resources are freely available on the web but you can access the information for free in the Business & IP Centre at the British Library, St Pancras. You will need a Reader Pass; details on how to obtain one can be found at http://www.bl.uk/bipc/visitus/howtouse/index.html. The resources are split into Directories, Business Advice Sources, Market Research and Statistics, Trade Magazines and Newsletters, and Internet Resources. Even if you cannot make it to the BIPC to access the publications these guides are valuable pointers to the key sources of information on industry sectors. Highly recommended. This time I really am going to do it. 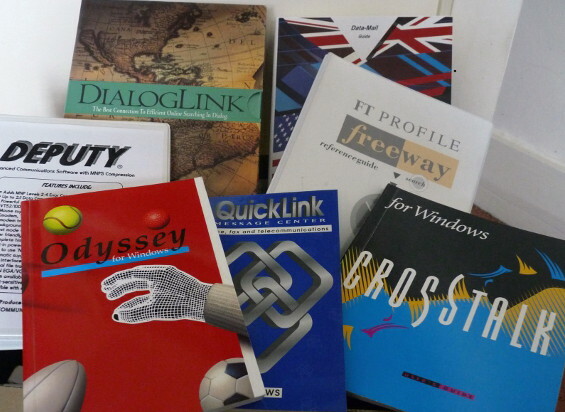 About 4 years ago I had a grand clear-out of my office and decided that my archive of telecoms software and manuals had to go. I offered them to anyone who was interested and a few items were snapped up. The rest are still sitting here in a box and I am offering them again to anyone who might be interested for historical reasons, research or whatever. You do not have to take the whole lot. Let me know if you are interested. Closing date is 28th May 2012 when they are definitely off to recycling. MBI Launcher v 1.2 (Windows) 3.5″ disk + hardcopy installation guide. Procomm Plus User Manual + Aspect Script Language Reference Manual + 2x 3.5″ disks, 3 x 5.25″ disks. 1991.